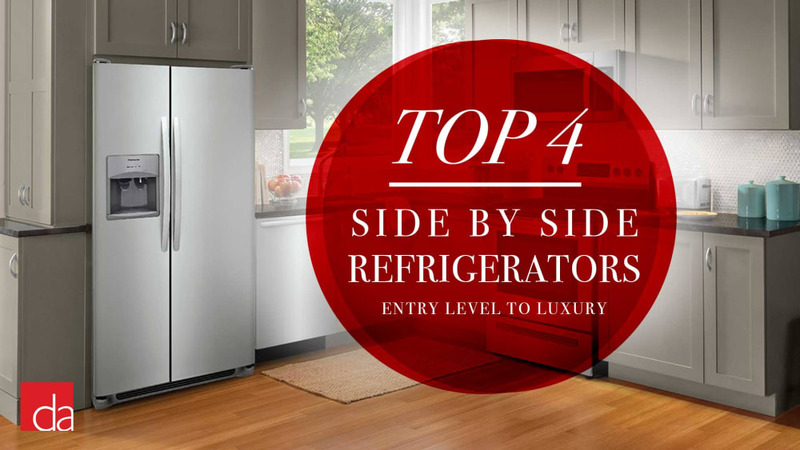 Side by side refrigerators have been popular since the 1960s. Up until recently, we have not seen any design innovations in this category of refrigerators; the freezer on the left side and the fridge on the right. Luckily, Samsung and LG introduced new design ideas to this segment. We now have LG's InstaView door which illuminates the interior with a gentle knock so we can quickly scan what's inside without opening the door. Also, the door-in-door (a.k.a. FoodShowcase) design provides easy access to family favorites. These innovations are not only convenient from the usability point of view but also help us save energy as the doors don't have to remain open. Currently, there are over 100 different choices (excluding color options) when it comes to side by side refrigerators. You can guess that the selection process is difficult among so many choices. We also noticed that most review sites rate and review discontinued models. This guide is up-to-date with current models and offers a simple classification "Entry-Level, Mid-Level, Premium, and Luxury." You can check our blog or the rest of our website to refine further your selection based on your specific needs and budget. (1) This efficient design is excellent for families that want to keep their freezers organized and easily accessible. Think of the bottom freezer models where food may get buried under the new arrivals. (2) Each door-wing is narrower compared to that of a wider swing single door refrigerator. This makes a side by side refrigerator fit in tight spaces easier. (2) The refrigerator is always on the right size which may present usability issues in some kitchen designs. You can now place your favorites strategically on the door in door section. This way you don't need to let cool air out when reaching for them. Both convenient and an energy saving feature. Great connectivity for smart-living. Compatible with Alexa, Google Assistant. You can get alerts or even use voice commands. This LG has the multi-air flow system to regulate humidity and temperature for longer storage of your groceries. Door in Door design saves energy since it eliminates the need to open the set of doors to reach for popular items. Most people like to place items to the back of the refrigerator for better cooling. Samsung, introduced "metal cooling" doors that make the front of the refrigerator as efficient as the back. ShowCase is Samsung's door in door technology that allows you to place high velocity items in the front shelves for easy access without letting cool air escape. Counterdepth design allows this fridge to blend with your surrounding cabinets. Twin Cooling Plus maintains humidity to keep fruits and vegetables fresher longer; minimizes freezer burn. Your fruits and vegetables will live longer in a Sub Zero thanks to the microprocessor controlled air quality, temperature and humidity. The patented door seal is so efficient that even when the power goes out your food will hold out for an extended period of time. This is a direct replacement of the old 561 Series. So if your old Sub Zero quit after 20 some years no need to worry about fitting the new built in version. True dual compressor system serves the fridge and the freezer separately. This prevents odor transfer and minimizes freezer burn effect. You will save money with Sub Zero in the long term due to its 20 year life-span design. Not to mention that a Sub Zero kitchen will increase the value of your home and it is the darling of the real estate marketeers. Design flexibility with panel ready or stainless steel door panel. You can even customize the top louvered panel. Install flush to cabinets or stand slightly proud. Crispers and deli drawers maintain lower temperatures and capture humidity to ensure freshness.